We will be providing real-time updates tonight as the eviction orders for Occupy LA and Occupy Philadelphia are carried out. 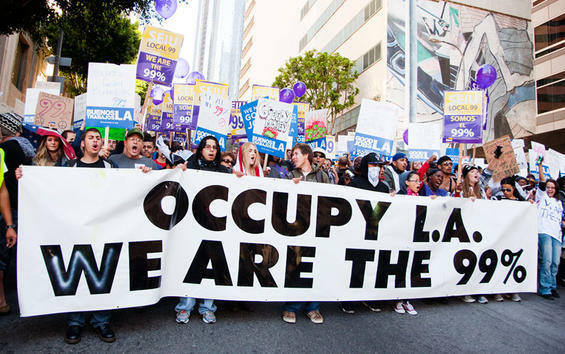 You can view the Occupy LA live stream below, and read our real-time news updates directly under the video feed. 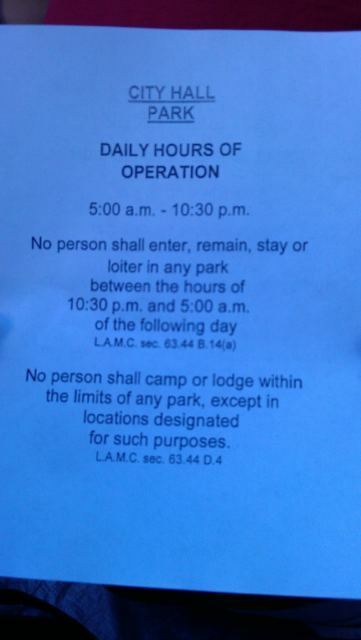 5:10 PM Rumors on the Internet say that Occupy LA eviction has been postponed 72 hours. 5:38 PM The group Midnight Ridazz announces a bike swarm tonight at 9pm in solidarity with the occupiers. Read their announcement here. 5:59 PM Crowd estimate: at least 700 people. 6:46 PM LAPD Captain will be available to media at 8:00 PM. 7:30 PM Occupy LA General Assembly starting. 8:40 PM General Assembly still happening. Committee updates are being discussed right now. 8:51 PM LAPD helicopters circling LA City Hall. 8:58 PM Live stream just reported more than 1200 people at Occupy LA. 9:42 PM General Assembly still in progress. Hard to hear the speakers over constant whirr of helicopter blades. 10:40 PM Just announced at GA that a Department of Homeland Security Immigration Customs Enforcement bus parked just outside of the protest. They announced in both English and Spanish. It’s obvious that the government will do anything to scare people away. 11:07 PM The police presence seems to be holding steady. Many different rumors about what’s going to happen, nobody seems to know anything for sure just yet. 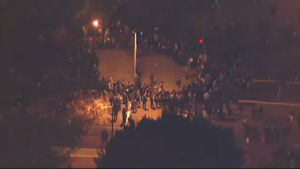 11:20 PM Click here to watch live over-head coverage of Occupy LA from the ABC7 News helicopter. 11:51 PM Huge march taking place around Occupy LA perimeter. Streets are being occupied. Live stream is reporting that police will be moving in soon, but that is still unconfirmed. Big crowd at 1st & Spring St. You can see the crowd from the ABC7 News helicopter stream. 12:02 AM The deadline for occupiers to leave their encampment has passed. No sign of increased police presence yet, but there are multiple unconfirmed reports the police are walking southbound on Spring St. toward the occupation. 12:17 AM Police moving down Main Street towards the encampment right now. They’ve stopped on the corner of Main & 1st. 12:20 AM More police moving in on encampment. At least 13 police cars just pulled in eastbound on 1st St.
12:26 AM Crowd now estimated at more than 2,000 people. 12:27 AM KTLA announced LAPD has issued a city-wide tactical alert as the deadline for Occupy LA protesters passes. 12:59 AM LAPD is requesting backup at Spring & 2nd. Sounds like there are a lot of LAPD helicopters overhead. 1:05 AM We’ve updated the live stream to show someone with a better camera – The now famous OakFoSho. 1:08 AM Unsure the total count, but there is a very heavy police presence now surrounding City Hall. 1:28 AM OakFoSho doing an interview on the live stream with a veteran in his military gear named Sam. Always good to see veterans on the front line! 1:48 AM While there is a heavy police presence, it does not look like they will be raiding the encampment anytime soon. Police are only wearing helmets and they are displaying their badges and names prominently. They are not wearing flak jackets or other protective gear, and they do not even have zip ties with them. 2:13 AM View screen captures from the over-head live streams on our Flickr photo stream. 3:07 AM Occupy LA is relatively calm for having more than 2000 people there. It seems as though the police are just trying to keep people off of the streets and that they won’t be raiding the park. 3:29 AM Live stream is showing interview with police spokesman. No arrests in LA tonight, and they are saying they will not arrest anyone if people move off the streets back in to the park. Police are telling people they would like to open the streets back up to traffic at 4AM. Both sides of the line have been very peaceful so far. 4:06 AM Riot police have arrived in large numbers. 4:13 AM Police have all pulled out their batons. Have not started moving in yet. 4:26 AM LAPD slowly moving in. No known arrests yet. Everything still peaceful. 4:30 AM KTLA5 starting interview with Commander Andrew Smith of LAPD. Reported a bit of vandalism but no violence or arrests. The most important part right now is that protesters get off the streets for morning traffic. Says the occupation will have to end eventually, it is not sustainable. They are going to give one last dispersal order to the protesters on the street and hope to be able to open up traffic within an hour. 4:45 AM A huge amount of riot police walking towards occupation. Crowd is humming the Imperial March from Stars Wars. 4:46 AM Police pushing in across intersection. Trying to circle the intersection. 4:50 AM Lots of police surrounding protesters in the street. LAPD has just issued the final dispersal order. Their only intent is to clear the street and not the encampment. Just declared the intersection of 1st & Main street and all surrounding streets an unlawful assembly. Threatening use of nonlethal munitions. Providing directions for crowd to disperse. Given 5 minute final warning. 5:05 AM Police pushing everyone on to sidewalks. 5:07 AM Threatening to arrest media if they are not on sidewalks. 5:10 AM Crowd chanting: “Who is blocking traffic now?” as hundreds of LAPD stand in streets. 5:15 AM Starting to get physical between LAPD and protesters. 5:26 AM Many officers are leaving the intersection in what looks like an attempt to open the streets back up to traffic. Still hundreds of officers on scene. 5:44 AM No updates. Still hundreds of police and thousands of protesters. 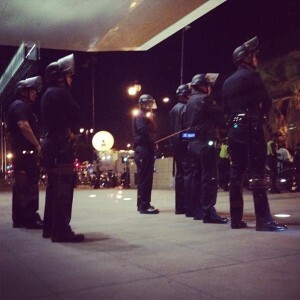 5:47 AM Reported by @OccupyPolice that there have been 3 arrests so far at Occupy LA. 5:52 AM Police lines are slowly backing up from protesters on the sidewalk. 6:02 AM Police are now on the sidewalk on the opposite side of the protesters. 6:07 AM Most police are now leaving. Rumored that streets will be open to traffic soon. 6:12 AM LAPD just announced that 1st street is now open to vehicle traffic and that all violations will be enforced. This looks to me like LAPD used this situation as a test run for the real raid on the encampment that is likely to take place within the next few days. Follow us on Facebook and Twitter for more updates throughout the day! Patrick Gokey is a United States Navy veteran and lifetime member of Veterans For Peace. He owns and operates Pete's Hamburger Catering in Madison, Wisconsin.